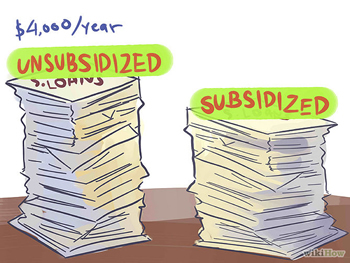 Key Difference: Subsidized loans are loans in which the government pays for the interest. In unsubsidized loans, the borrower has to pay the interest along with the principle amount. College is portrayed as people having the time of their lives, with parties, fraternities, moving away from home and finding yourself. However, all of these are put to the backburner when the person is hit with finance that comes with going to college. Colleges are not cheap and many people require some form of help in order to pay all the bills. There are financial aid, scholarships, grants and the most common type of financing: loans. Scholarships require maintain grades and sometimes even that may not qualify a person for a scholarship. A lot of people don’t apply for loans because they believe that they many not qualify for low premium loans and may end up having to pay huge interest rates, resulting in debt. However, the government does offer federal student loans that come with cheap premium rates. There are two types of federal loans: subsidized loans and unsubsidized loans. Subsidized loans are loans which are provided only to undergraduate students looking for a higher learning. The major benefit of a subsidized loan is that the government or rather the Department of Education ends us paying for the interest that the loan accumulates. At the end of the term, the student would only have to pay the principle amount that too six months after they graduate from college. However, subsidized loans are often reserved for the people who desperately need financial aid and have no way to pay for the education. If the person can prove this, they will be able to avail subsidized loans. Unsubsidized loans are low-interest loans in which the borrower has to pay the interest along with the principle amount. These loans are not limited to undergraduate students but also graduate students. 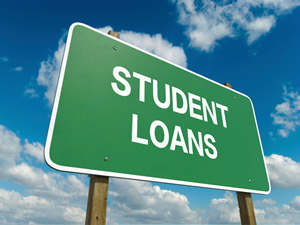 Most students are able to avail unsubsidized loans, with a 6.8% interest, fairly low compared to personal loans. The interest is added to the borrowing amount and the borrower is responsible for pay the principle amount and the accumulated interest. However, they do not have to pay off the loan until six months after graduation.